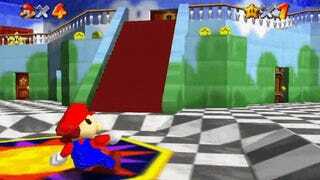 Yes, Super Mario 64 has been around for nearly 20 years. No, that doesn't mean people have stopped coming up with new ways to play it. Introducing Mario 64: Chaos Edition. It's the strangest, most frightening thing. "I modified the original SM64 to randomly patch [old cheat device] Gameshark codes I found on the Internet (or made myself) to the game. This resulted in a pretty funny, instable and frustrating game. Don't take this too serious and don't try to get any progress done in the game. You won't." It should be noted that you need an emulated copy of Super Mario 64 running on your PC to get this working. Here's a video of YouTuber Vinesauce—known for his playthroughs of "corrupted" games—putting Chaos Edition through its paces. Skip to 3:35 for the Truest Horror. It's all so very strange and wrong. Also very funny, when it's not actively heaping coal into my brain's nightmare furnace. Still though, it goes back to a thing I wrote recently: game glitches and oddities—weird ones, unnatural ones, unexpected ones—have the potential to be more terrifying than anything else in games. This goes double when a comforting childhood memory like Mario 64 is twisting its head around backward and vomiting pixels at you. If you have the gumption to give it a go yourself (note: make sure you own a copy of Mario 64 in some form or fashion; Kotaku does not condone piracy), I'd love to hear/see how it goes. If not, well, here are a few more videos of your happy youthful memories being twisted into a pretzel of pure, writhing agony. Have fun!